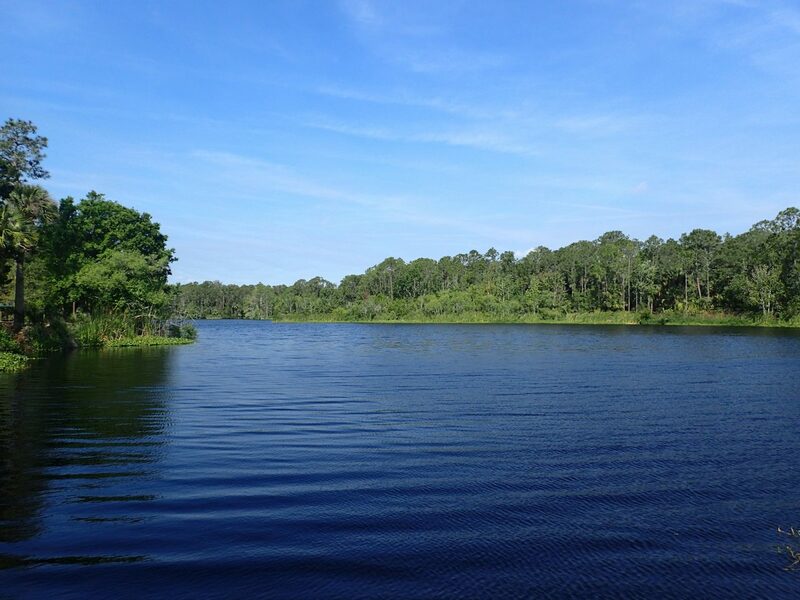 Biking Tosohatchee | Florida Hikes! 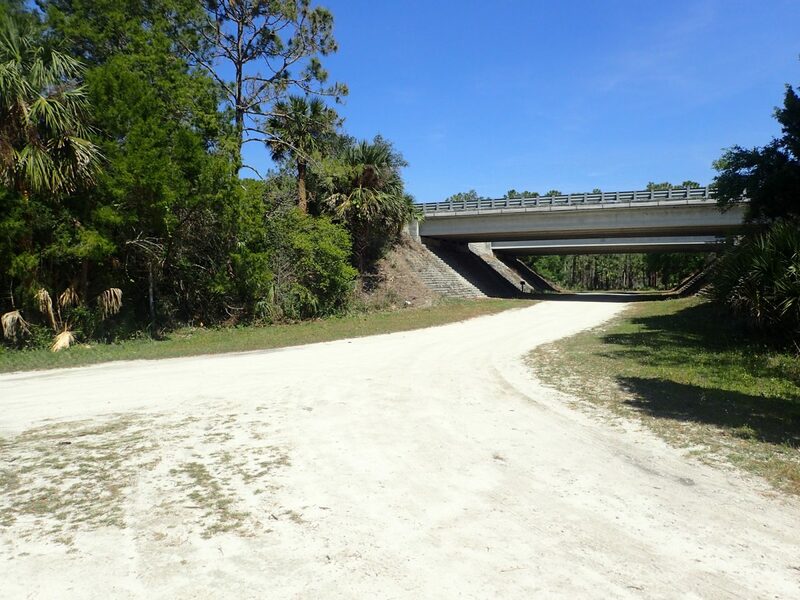 I have ridden the trails of Tosahatchee for a very long time, taking some of my earliest mountain bikes here after it was established as a state park in the late 1970s. But I had never ridden under the Beachline, nor had I made it all the way to the St. Johns River. Visiting the 1917 Beehead Ranch was one of my favorite rides. Moved to Fort Christmas Park in 1993, the old Beehead Ranch House isn’t in these woods any more. 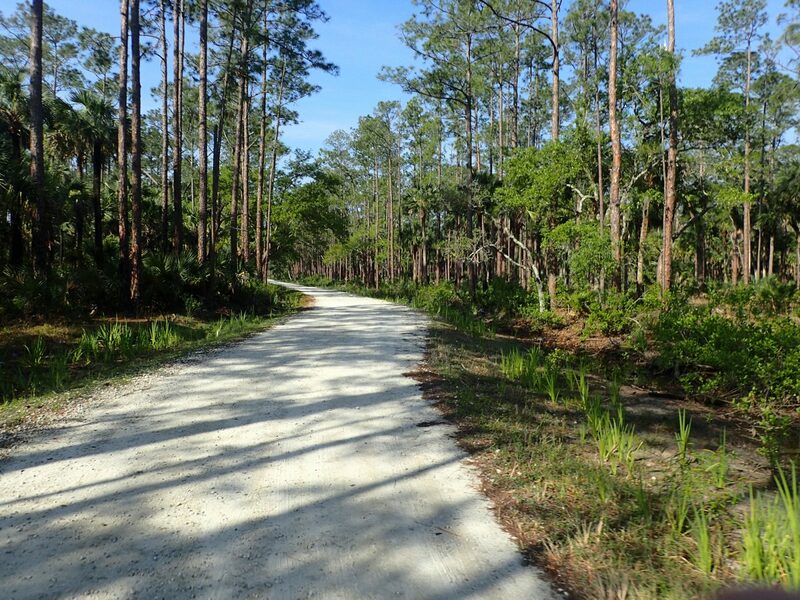 We were parked on Ranch Road, however, which used to lead there, and Sandy was preparing to wander off with our local Florida Trail Association chapter for a hike on the Beehead Ranch Loop. 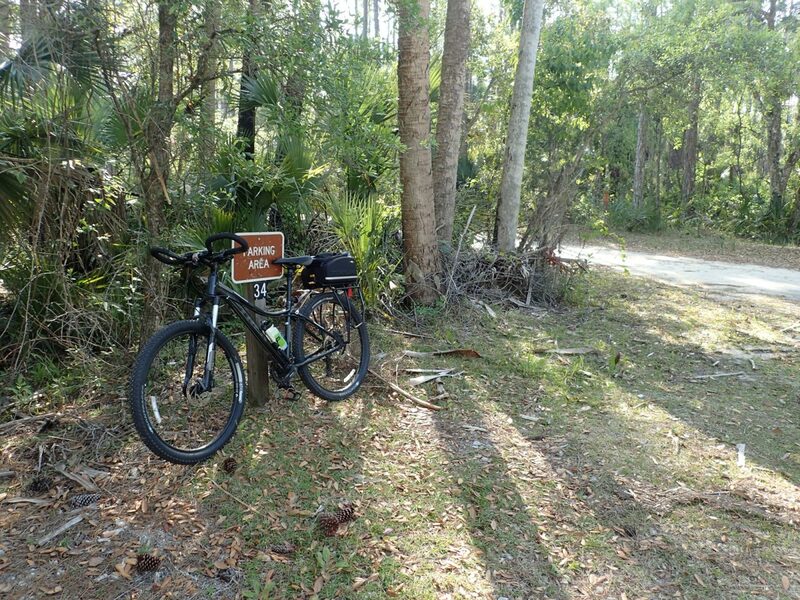 From the same trailhead, Parking Area 35, I began a bike loop that would take me to places I had never explored. Parking Area 34 is a more easily accessed start/end point for this ride. Use any of the parking areas on Fish Hole Rd or Powerline Rd to do this loop. Following Ranch Road back out to the main north-south road, Fish Hole Road, I headed counter-clockwise from Parking Area 34. Riding on packed dirt roads with little or no traffic has become my favorite place to ride. With no traffic noise to contend with, the only sounds I heard were from the birds, the wind in the tall pine trees, and the little hum that the off-road tires make. I had been to the bridge over Jim Creek once before. I knew that I was getting close when I started seeing fresh green leaves on the sweetgums, and new needles on the cypress trees. When I came to a nice cypress tree along the road I had to pose the bike at its base for a photo. Jim Creek was low. It looks like an ancient place. 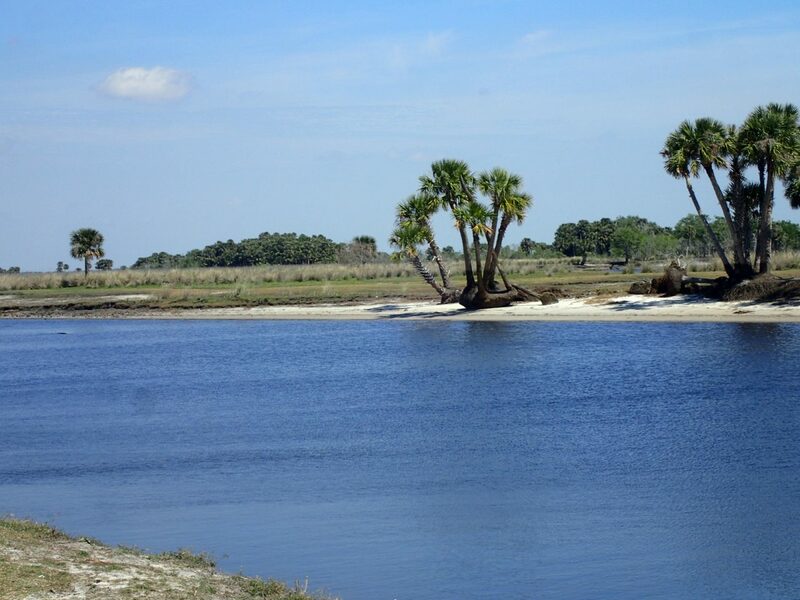 Here I could see a couple of larger cypress trees along the creek’s edge. 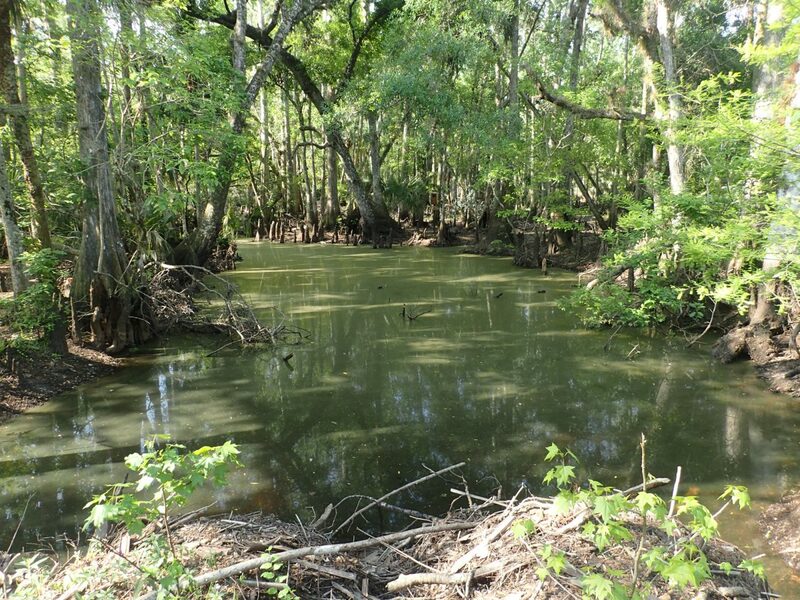 It flows north towards the St. Johns River, making a diagonal through the preserve. 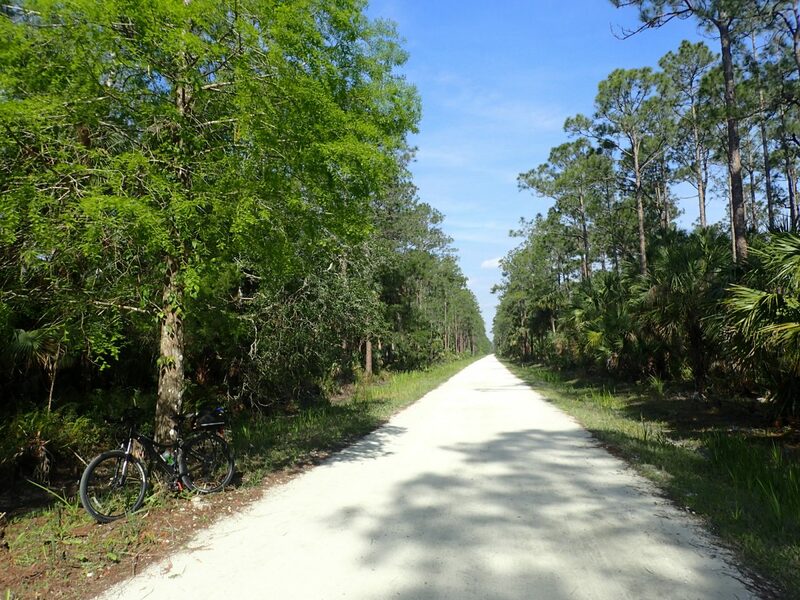 Along it is a virgin cypress forest, which the Florida Trail reaches at the Swamp Spur Trail. 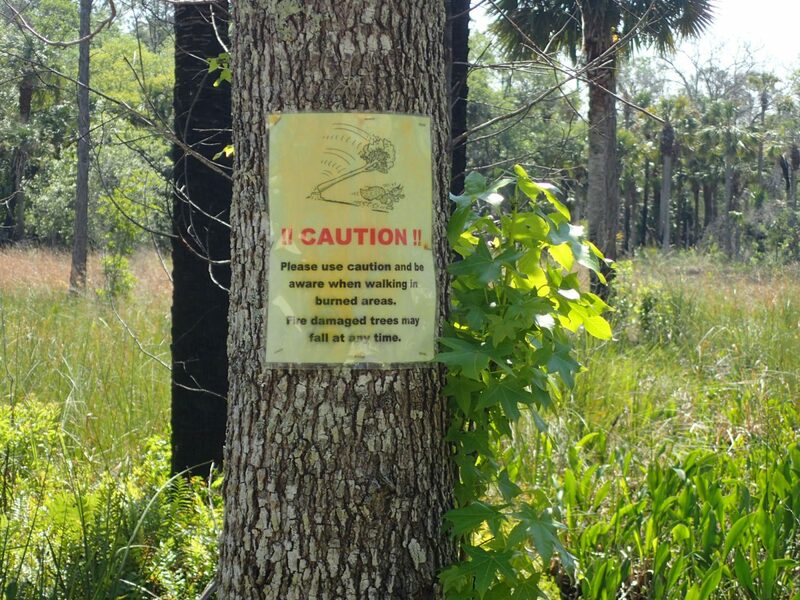 The ancient cypress and pines in Tosohatchee are here because of the foresight of hunters. 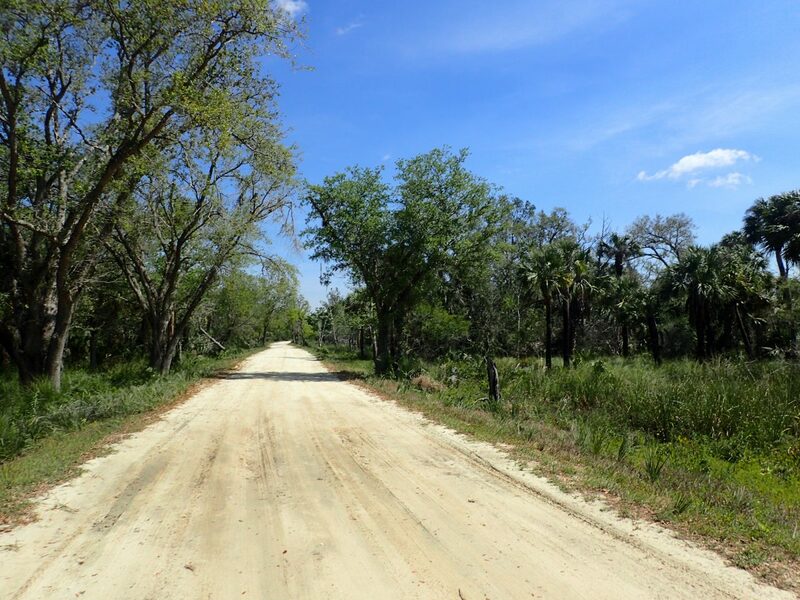 After several decades of ranching ended, an Orlando-based hunting club bought the ranch in 1925. 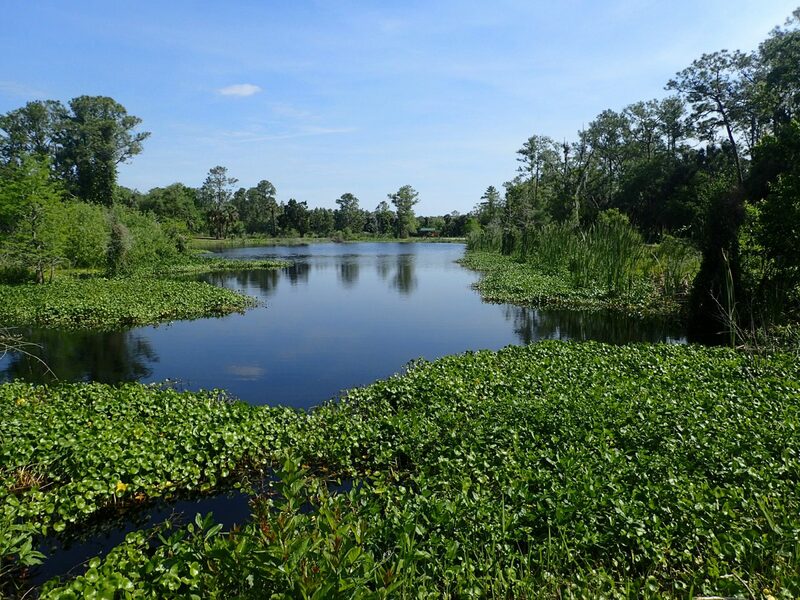 They held onto this wild place until 1977, when it was sold to the state of Florida for conservation forever. After I went under the bridge for the buzzing Beachline, the toll road between Cocoa and Orlando, I turned right on Charlie’s Lake Road. I was looking forward to seeing a lake that I had heard about, but had never seen. From my first glimpse, I could tell that it was going to be a great find. A finger peninsula reached out along a narrow waterway between two bodies of water. At the parking lot, there was a paved handicapped parking spot and a paved path to the privy. This large dirt parking lot leads to a second larger peninsula with covered picnic tables and a great boardwalk over the water at its end. As often happens, I had this beautiful place all to myself. I began making plans to bring Sandy and a couple friends on an off-road picnic to this beauty spot, by bike of course. If it weren’t for the sound of Beachline traffic in the distance, I would have given this place a “10.” Ironically, the lake is here because of the highway. 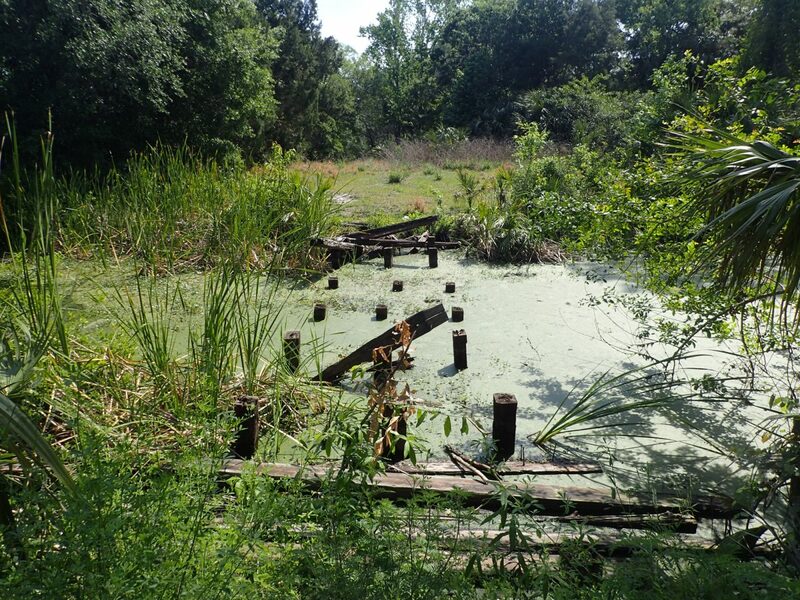 These ponds were excavated to provide fill way back when it was built. My map didn’t go into any detail of what was at the end of Charlie’s Lake Road, and it was a perfect day for exploring. So I rode past the lake down a narrow hard-packed dirt road. The farther I went, the quieter it became. Ending in a loop, I circled it and retraced my track back to the lake. While I was exploring the loop, a young fellow had taken my place along Charlie’s Lake. He was casting his fishing line as I went by. I had noticed another turnoff earlier before finding Charlie’s Lake. The sign read Mud Lake. Two new lakes on the same ride, why not? I took this road until a lone picnic table and a pile of rocks met me at its end. Climbing to the top of the rock pile, I could see the remains of an old wooden bridge. It probably washed away years ago when the St. Johns River flooded and washed its decking away. The posts were still there, and I could see the road on the other side. I wished there was an easy way to get to the other side. I believe that I was dreaming of how to get across the Mud Lake Canal. I would notice signs for this canal elsewhere in the park. Back toward the main road, I turned onto the only road I hadn’t explored south of the Beachline. 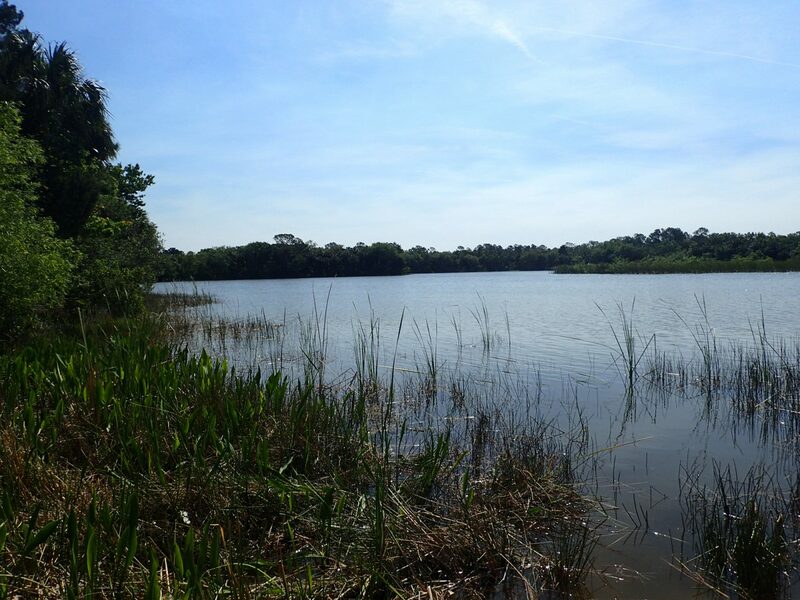 It was a short ride to where I could see cattails and open sky above a lake. The road appeared to make a T at the cattails. I was excited at the thought of riding around the perimeter of a lake, but my dream came to a quick end. To the left, a short path led to the lake, ending in a narrow gravel put-in. To the right, there was just enough room to turn a vehicle around. Back under the Beachline, I was in search of the St. Johns. 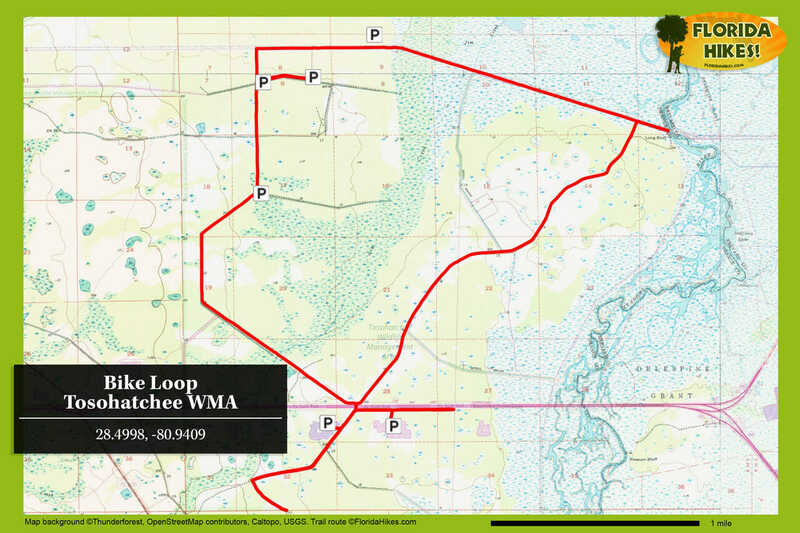 My map, a screenshot off the FWC website, lopped off this side of the loop. I’d hoped to find a paper map at the pay station on the way in to Tosohatchee but no luck. 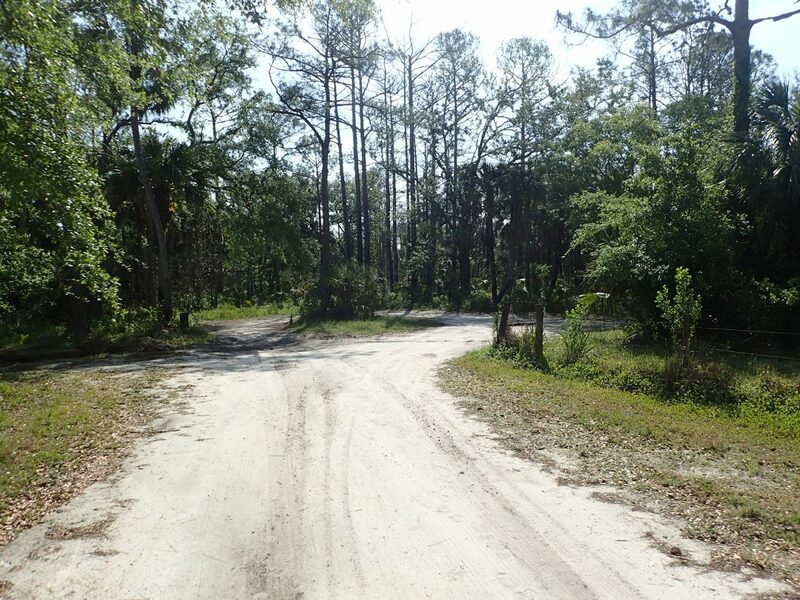 So off the map I rode, only knowing the road I was on would make a loop after it reached the St. Johns River. The sounds of airboats way off in distance gave me hope. 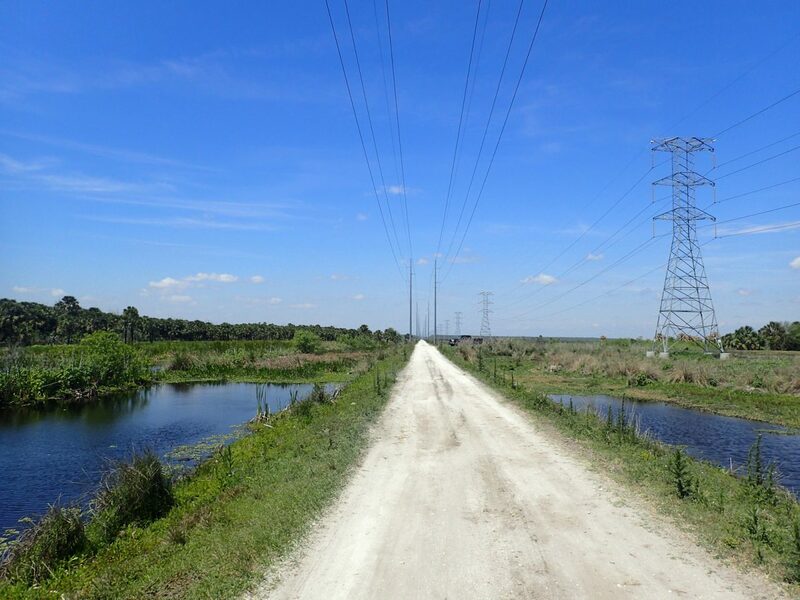 Seeing the power lines in the distance after miles of riding, I knew that I was drawing near. While on this less-traveled route, Long Bluff Road, I decided to stop for a snack. Without thinking, I stopped without removing my left foot from the cage. As the bike began to tilt, there was no time to get my foot free before I found myself still strapped in and laying in the dirt. It could have been much worse! Pavement would have been harder and hurt more, or there could have been someone there to see me do such a foolish thing. I should have stopped and eaten something earlier. Riding hard without eating along the way always makes me a little woozy. Reaching Powerline Road, I could see the St. Johns River and its enormous flood plain. When I reached the river, there were a few people fishing. But even with my arrival, we humans were still quite outnumbered. The river is low enough for a sandy beach on each side, but I don’t think the alligators are willing to give up their prime sunning locations. Powerline Road is raised to allow access to the river even during major flooding. With this raised elevation, it’s easy to look down into the deep ditches on both sides of the road. 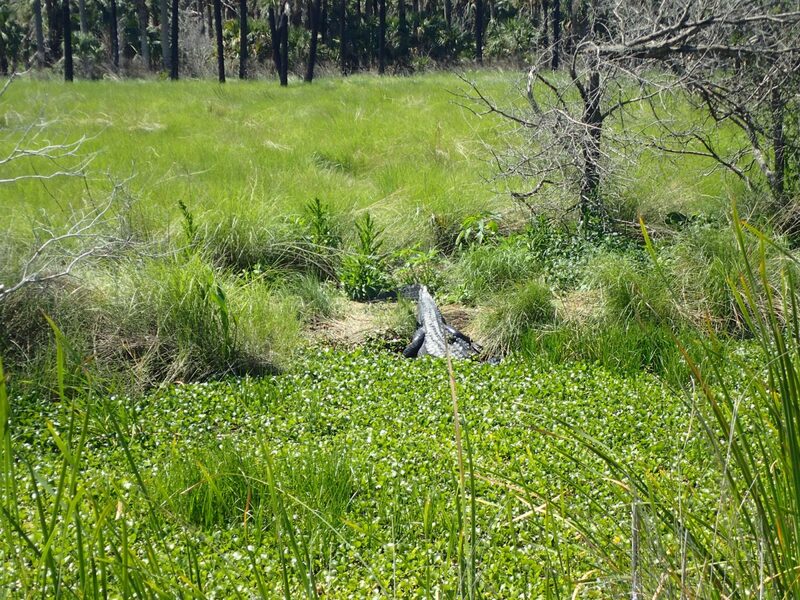 Seeing gators to the left and gators to the right, I stopped counting at two dozen. From three feet to “OH MY”! One might have been the biggest alligator I have ever seen in the wild. Taking his picture, I noticed how big and thick his tail was. It curved to form an ‘S.’ The tail was over 5 feet long. Add the back legs and the middle part of its body for another 3-1/2 feet. The rest, about as wide as my handlebars, went under water. Add front legs and a head, and he’s bigger than I care to think about. With only sand, water, and a bicycle between us. Yikes. It was time to quickly move on. 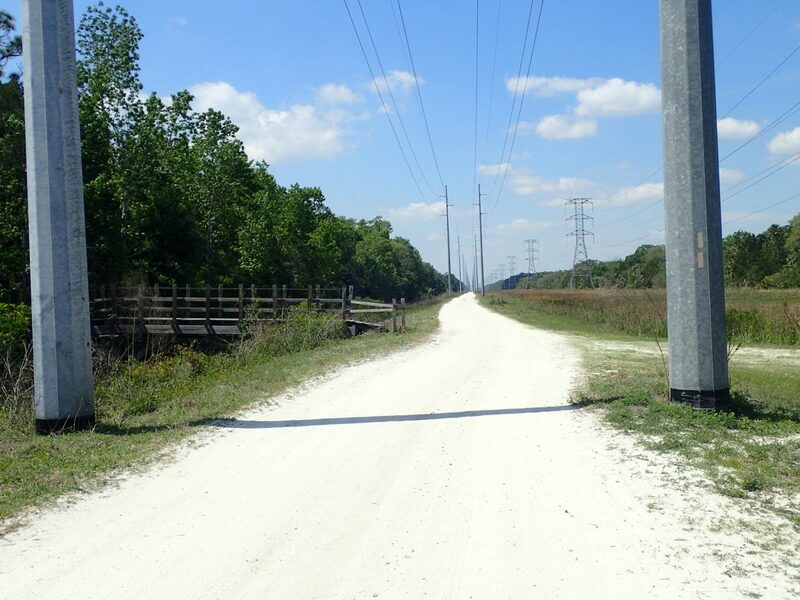 As I rode between the power lines, it was like being on a straight railroad track, going on and on and on. I stopped for a selfie in both directions. It looks pretty much the same either way. After 5 miles along this stretch, all I remember is one curve and two bridges before leaving the open floodplains and entering the forests again. Turning down Fish Hole Road, it wasn’t far until I hit Ranch Road again to seal the loop. I could see the sunlight glistening off the parked cars. Sandy and the other hikers were still out in the woods, working on their 8-mile loop around the old Beehead Ranch. Meanwhile, I hopped off the bike and wrapped up my 20.2-mile off-road adventure. 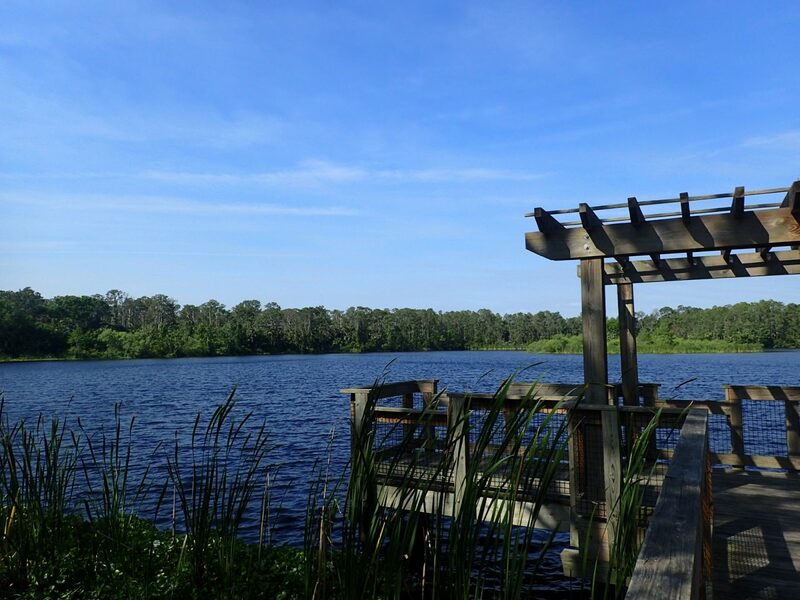 I found two lakes and saw a piece of the St. Johns River I’d never seen before. It was a great way to get to know Tosohatchee WMA. Have been here in truck exploring.